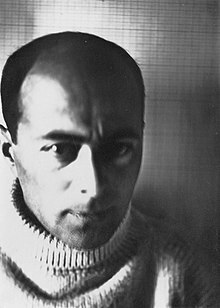 Lazar Markovich Lissitzky [Лазарь Маркович Лисицкий] (November 23, 1890 – December 30, 1941), more famous as El Lissitzky [Эль Лисицкий], was a Russian artist, designer, photographer, teacher, typographer, and architect. He was an active protagonist of Russian Constructivism. For us [the young artists in Vitebsk, before 1920] Suprematism did not signify the recognition of an absolute form which was part of an already completed universal system, on the contrary; here stood revealed for the first time in all its purity the clear sign and plan for a definite new world never before experienced - a world which issues forth from our inner being and which is only now in the first stages of its formation, for this reason the square [ Malevich's Black and Red Square ] of suprematism became a beacon. ..into this chaos [after the Bolshevik' revolution] came suprematism extolling the square [referring to the Squares of Malevich] as the very source of all creative expression, and then came communism and extolled work as the true source of man's heartbeat. New space neither needs nor demands pictures - it is not a picture transposed on a surface. This explains the painters' hostility towards us [a. o.: Malevich ]: we are destroying the wall as the resting place for their pictures. We have had enough perpetually hearing MACHINE MACHINE MACHINE MACHINE. In the repetition of the word MACHINE, we read the modern artist's ambivalent relationship to mechanical reproduction: on the one hand, the rigorous linear order and uniform application of ink presented by the thrice-repeated type written line celebrates sterility; and on the other hand the content of the sentence itself bemoans the transformation of the industrial paradigm into an aesthetic cliché. Proun is the the Step-over from the art of painting to Architecture [original text in German:] (Umsteige-station von Malerei nach Architectur). The term A[rt] resembles a chemist's graduated glass. Each age contributes its own quantity: for example, 5 grams of the perfume 'Coty' to tickle the nostrils of the fine gentry. Or another example, 10 cc of sulfuric acid to be thrown into the face of the ruling classes. Or, 15 cc: of some kind of metallic solution that later changes into a new source of light.. ..[as Lissitzky goes on to say] This A[rt] is an invention of the mind, i.e. a complex, where rationality is fused with imagination. We have named PROUN [the art, stepping over from painting to architecture] a station on the path to the construction of the new form.. .From being a simple depicter the artist becomes a creator (builder) of forms for a new world — the world of objectivity. This does not mean the creation of a rivalry with the engineer. Art has not yet crossed paths with science. PROUN is understood as the creative construction of form (based on the mastery of space) assisted by economic construction of the applied material. The goal of PROUN is progressive movement on the way to concrete creation, and not the substantiation, explanation, or promotion of life. The path of the PROUN does not lie within the narrowly limited, fragmented, and isolated scientific disciplines — the builder consolidates them all together in his own experimental investigation. The path of the PROUN is not the incoherent approach of separate scientific disciplines, theories, and systems, but is rather the straightforward path of learned influence over reality. We analyzed the first stage of our construction, confined to two-dimensional space, and found it to be as durable and resistant as the earth itself. We build in this space just as we would on the ground, and therefore must take as our point of departure the concepts of gravity and force of attraction, as the foundation of everything built on the land. In PROUN the reciprocity of the effects of gravity [Newton, 'for every action an equal and opposite reaction'] manifests itself in a new capacity. We see that on the surface (plane) of the picture, the PROUN ceases to exist as such and becomes a building surveyed from every direction — considered from above or examined from below. The result of this turns out to be the destruction of the single axis that leads to the horizon. PROUN alters the conventional forms of the arts and leaves behind the image of the petty individualist, who locked himself in his office and hid seated before a drawing easel, starting one picture and finishing another. The future life — this is the reinforced concrete slab for the communist foundation of the nations of the entire world. With the aid of the PROUN one can build a unified city-commune on that foundation, intended for the life of all mankind. At present we are living through an unusual period in time a new cosmic creation has become reality in the world, a creativity within ourselves which pervades our consciousness.. ..in this way the artist became the foundation on which progress in the reconstruction of life could advance beyond the frontiers of the all-seeing eye and the all-hearing ear. Thus a picture was no longer an anecdote nor a lyric poem nor a lecture on morality nor a feast for the eye but a sign and symbol of this new conception of the world which comes from within us. The pace of life has increased in the last few decades just as the speed of the motor bicycle has been exceeded many times over by the aeroplane. After art passed through a whole series of intermediate stages it reached cubism where for the first time the creative urge to construct instinctively overcame conscious resolve.. ..from this point the picture started to gain stature as a new world of reality and in this way the foundation stone for a new representation of the shapes and forms of the material world was laid. It proved to be essential to clear the site for the new building. This idea was a forerunner of futurism which exposed the relentless nature of its motivating power. Revolutions had started undercover, everything grew more complicated. Painting economical in its creative output was still very complicated and uneconomical in its expression. cubism and futurism seized upon the purity of form treatment and colour and built a complicated and extensive system with them combining them without any regard for harmony. The rebuilding of life cast aside the old concept of nations classes patriotism and imperialism which had been completely discredited. And amid the thunderous roar of a world in collision WE, ON THE LAST STAGE OF THE PATH TO SUPREMATISM BLASTED ASIDE THE OLD WORK OF ART LIKE A BEING OF FLESH AND BLOOD AND TURNED IT INTO A WORLD FLOATING IN SPACE. WE CARRIED BOTH PICTURE AND VIEWER OUT BEYOND THE CONFINES OF THIS SPHERE AND IN ORDER TO COMPREHEND IT FULLY THE VIEWER MUST CIRCLE LIKE A PLANET ROUND THE PICTURE WHICH REMAINS IMMOBILE IN THE CENTER. The empty phrase 'art for art's sake' had already been wiped out. This dynamic architecture provides us with the new theater of life and because we are capable of grasping the idea of a whole town at any moment with any plan the task of architecture - the rhythmic arrangement of space and time - is perfectly and simply fulfilled for the new town will not be as chaotically laid out as the modern towns of north and south America but clearly and logically like a beehive.. This is the way in which the artist has set about the construction of the world - an activity which affects every human being and carries work beyond the frontiers of comprehension. We see how its creative path took it by way of cubism to pure construction, but there was still no outlet to be found here. The short step then required to complete the stride consists in recognition of the fact that a contre-relief is an architectonic structure, but the slightest deviation from the plumb-line of economy leads into a blind alley. The same fate must also overtake the architecture of cubist contre-relief.. .By taking these elements FROM THEM for itself it wants to become equally entitled to take its place alongside them as a new creation. The reference is to the narrow technical discoveries for example the submarine, the aeroplane, the motors and dynamos of every kind of motive power in each part of a battle-ship. Contre-relief is instinctively aware of their legitimate origin their economy of form and their realism of treatment. Cubism demonstrated in its constructions its modernity in relation to scale, but in painting and contre-relief we have in front of us an absolute scale which is this - forms in their natural size in the ratio 1 : 1. If however we wish to transform the contre-relief into an architectural structure and therefore enlarge it by one hundred times, then the scale ceases to be absolute and becomes relative in the ratio of 1 : 100. Then we get the American statue of liberty in whose head there is room for four men and from whose hand the light streams out. We must take note of the fact that the artist nowadays is occupied with painting flags, posters, pots and pans textiles and things like that. What is referred to as 'artistic work' has on the vast majority of occasions nothing whatever to do with creative effort: and the term 'artistic work' is used in order to demonstrate the 'sacredness' of the work which the artist does at his easel. The conception of 'artistic work' presupposes a distinction between useful and useless work and as there are only a few artists buyers can be found even for their useless products. The artist's work lies beyond the boundaries of the useful and the useless. Therefore THE IDEA OF 'ARTISTIC WORK' MUST BE ABOLISHED AS A COUNTER-REVOLUTIONARY CONCEPT OF WHAT IS CREATIVE and work must be accepted as one of the functions of the living human organism in the same way as the beating of the heart or the activity of the nerve centers, so that it will be afforded the same protection. Then I can see that I'm with you [in Dresden] at the end of April - beginning of May. Then I'll also paint with you the few works which are desired of me, if you'll help me - because I have already forgotten how to paint. Painting.. ..turned to the design of purely abstract volumetric forms.. .Since the leading exponent of the color theory was a painter (Malevich), he failed to recognize the objective reality of the world [in architecture!]. Because he always looked at it only through his own eyes, he remained trapped in a world devoid of real objects. The broader implications of this had to be developed by us, the architects. The second conception of the world via the medium of matter required both a visual and a tactile perception of things. In this case the whole design process tends to emanate from the specific characteristics of the respective medium used. The leader of this movement (Tatlin) assumed.. ..that the intuitive and artistic mastery of materials would lead to inventions on the basis of which objects could be constructed. He believed he could prove this theory with his design for the 'Monument to the Third International' (1920), [never built]. He accomplished this task without having any special technical knowledge of construction. In America the architect has a direct and continuing relationship with technology. Perhaps this is why he does not ask more from technology than it can offer. In our country [Russia] it is still impossible to have such urban complexes as are found in Paris, Chicago, or Berlin. It is through technology that we can build a bridge to all the most recent achievements, which is what made it possible for our country to pass directly from the hoe to the tractor without having to travel the long path of historical development. That is why we want to introduce the most modern methods of building and construction into our country — and why we see the works and designs of both the 'formalists' and the 'constructivists' as a radical experiment in the manipulation of construction. One of our [his] utopian ideas is the desire to overcome the limitations of the substructure, of the earthbound. We have developed this idea in a series of proposals (sky-hooks, [like Lissitzky's paper-architecture design 'Wolkenbügel' (1924)] stadium grandstands, Paris garage].. .It is the task of technology to make sure that all these elementary volumes that produce new relationships and tensions in space will be structurally safe.. .The idea of the conquest of the substructure, the earthbound, can be extended even further and calls for the conquest of gravity as such. It demands floating structures, a physical-dynamic architecture. In the future it will be necessary on the one hand to establish a balance between the intimate and individualistic demands for housing, and on the other to take full account of general social conditions. Thus, for example, cooking should be transferred from the private single kitchen into the communal cooking laboratory; the main meal should be consumed in public eating establishments; and the rearing of children should become the responsibility of the kindergarten or the school.. .Presently our goal is the transition from housing as an agglomeration of many private dwellings to housing communes. What we demand from the Soviet architect is that, as an artist and because of his perceptive intellect, he will fully comprehend and amplify the faintest ripple of developing energies much sooner than the masses — who tend to be shortsighted as far as their own growth is concerned — and that he will transform this energy into tangible architectural form.. .The club's role is to become a University of Culture. If one accepts the premise that private dwellings should strive to operate on the basis of the greatest possible austerity, then by contrast, public dwellings should provide the maximum of available luxury accessible to all. The term 'reconstruction' is therefore not applicable to this case, since there is no building precedent in the past. It has become obvious to the new architect that by virtue of his work he is taking an active part in the building of a new world. For us the work of an artist has no value 'as such'; it does not represent an end in itself; it has no intrinsic beauty. The value of a work of art is determined by its relationship to the community.. .The artist, or the creative worker, invents nothing; there is no such thing as divine inspiration. Thus we understand by the term 'reconstruction' the conquest of the unresolved, of the 'mysterious,' and the chaotic. In our [Russian] architecture, as in our entire life, we are striving to create a social order, i.e., to raise the instinctive to a conscious level. (a) The rejection of art as a mere emotional, individualistic, and romantic affair. (b) 'Objective' work, undertaken with the silent hope that the end product will nevertheless eventually be regarded as a work of art. (c) Consciously goal-directed work in architecture, which will have a concise artistic effect on the basis of well-preparated objective-scientific criteria. Such an architecture will actively raise the general standard of living. This represents the dialectic of our development process, which purports to arrive at the affirmative by negation — a process similar to melting down old iron and forging it into new steel. I was born on 23 November 1890 in a village in the province of Smolensk. Grew up in Smolensk, in the home of my grandfather, a cap-maker. Completed secondary school there. At the age of 15 I started earning money by giving drawing lessons. Passed the entrance examination of the art academy in Leningrad but, being a Jew, was not admitted due to the restricted percentage. [I] Went to Germany to study there and graduated from the architecture faculty in Darmstadt in 1914. I studied art during my trips through Europe; went to Paris. In the summer of 1912 I traveled more than 1200 km in Italy on foot, learning and drawing. In 1912 my works were accepted for the first time at the large exhibition in Petersburg. From 1915 in I lived in Moscow, exhibiting each year. From the beginning of the [Sovjet] Revolution I was a member of the Committee for Art. Was commissioned for the first Soviet flag for the First of May 1918, which was carried across Red Square by members of the government. Later I worked at 'Izo Narkomprosa'. From 1919 I taught at the Higher Artists' Workshops in Vitebsk (our students Suetin, Judin and others). During my stay in Germany in 1922 I collaborated with the writer Ehrenburg, on the Magazine 'Veshch' (Gegenstand) [= Object] (first pro-Soviet edition). [I] Took part in organizing the First Russian Art Exhibition 1922-23 in Berlin and Amsterdam. My works were purchased by European and American collectors and museums. The museum in New York acquired a 'Proun' from the Soviet Exhibition. At this time, in 1923, I contracted pulmonary tuberculosis. Back in Moscow in 1925 - teacher at 'Vchutemas' of interior design and furniture at the faculty of wood and metalwork. In 1926 my most important artistic work began: designing exhibitions. In that year I was invited by the committee of the International Exhibition of Art in Dresden to design the space for contemporary art. Was sent abroad for by 'VOKS'. [In] 1927 Exhibition of Typography in Moscow. In 1935 I was appointed leading artist of the All-Soviet Agricultural Exhibition. I opposed the errors of the first leader, and resigned. Afterwards, while I was still in the sanatorium, I took over the design of the main building. The design of the main hall has been done according to my idea until now. From 1931 on, I was leading artist-architect of the 'Permanent Building Exhibition'. But as the years went by, my health deteriorating, I had less and less energy left for this type of commission, such as the realization of large-scale exhibitions. I still succeeded in designing the project for the museum-exhibition of the Ministry of 'Social Security'. At the time when I was working on the exhibitions I was also very active as a book artist and in photo montage (for I could carry out those assignments when my sickness obliged me remain lying down). In 1928 I designed a photo-montage frieze of 24 by 3.5 m for our 'Pressa' pavilion. It became the example par excellence for all larger-than-life montages, which were a permanent feature of the exhibitions from then on. During Majakovskij's stay in Berlin in 1923 I was commissioned to design his book 'For the Voice'. The book was recognized as the starting-point of a new typography, and the Gutenberg Society in Mainz made me a member. Another field of my work is the artistic and poly-graphic design of albums and periodicals. At present , not taking my serious illness into account, I still hope to make something for the 25th anniversary of the October Revolution. - El Lissitzky, June 1941, Moscow Notes. The purpose of architecture is to transmute the emptiness into space, that is into something which our minds can grasp as an organized unity. Lazar Markovich [Lissitsky], I salute you on the publication of this little book. [El] Lissitzky does exclaim 'Schafft Gegenstande' [Make Things]. But by this he does not mean real things.. .But why 'Gegenstande [Things]'? He only wants to make pseudo-things which express his urge for reality, for the earth. Things of the same hardness, immovability, earthbound in the same way as the daily life he sees around him. * Not all Constructivists concentrate so strongly on reality.. .Moholy Nagy's work is 'l'art pour l'art' - as opposed to Lissitsky who is demonstrative; he is ethical in as much as he [Lissitsky] propagates the Bolshevist morale of not dreaming but doing, of preferring a direct gesture rather than one of beauty.. .Lissitsky wants nothing to do with 'l'art pour l'art'. 'Proun' – as he called his work – is art in order to demonstrate the feel of reality. In 'Kunstismen' [art magazine, published by Lissitsky and Jean Arp ], Lissitsky defines Proun as the 'Umsteige-station von Malerei nach Architectur' (the 'Step-over from the art of Painting to Architecture'). But the projects with which the architects of Russian proletarian architecture present us are not only based on pure imagination, but their construction would, if they were fitted for realization, entail enormous waste of space and materials. The dwelling complex 'Wolkenbügel' [designed by Lissitzky, with the help of Emil Roth - Swiss architect, 1924] (assuming that one could live here without either freezing or melting! ), shaped like a 4, stands in a very un-constructive way on three legs in which the elevators are located. The latter take up as much space as would one or more skyscrapers. And these 'architects' are to teach the West what architecture is! There were tasks of a special kind awaiting him. He was needed in his homeland; the Soviet Union needed all his [Lissitzky's] knowledge, his experience, his art. Lissitzky was at first able to sustain a radical suspension of alternatives, to destabilize the spectator's spatial assumptions - as analogues for social assumptions - without replacing them with ready-made solutions; but that, as the dictatorship [of Stalinism ] grew in power, it overwhelmed this fragile possibility and inserted its own new/old closures into the sphere of graphic and ideological work alike. As long as Lissitzky kept intact the Utopian force of his (political) desire the radical project was sustainable; but as soon as the circumstances closed off his Utopian impulse, he was faced with no possibilities other than silence or service.